The Marshall Project is one of the more prominent of the nonprofit news sites with a deepened focus on a single topic—in this case, criminal justice. Others in its ilk are Inside Climate News and The Trace, which focuses on gun control. Each has its own flavor of coverage, with the Marshall Project taking a less advocacy-focused role by design. That may change a bit with the introduction of its newest endeavor. 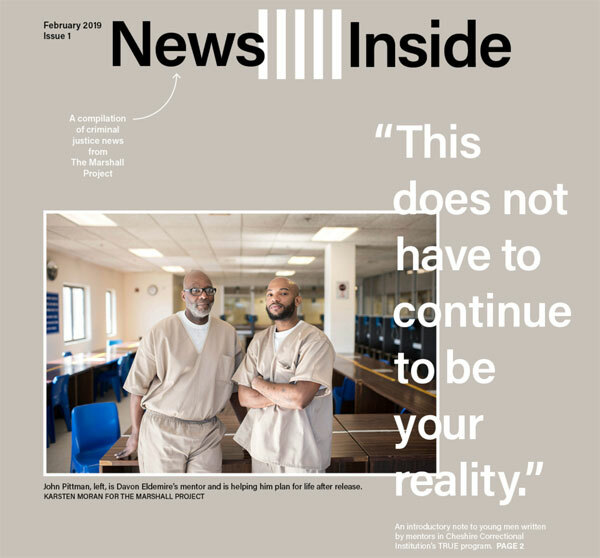 The Marshall Project has launched News Inside, a periodical about incarcerated life in the United States, to be distributed to those who are currently in prison. Access to educational materials for incarcerated individuals has been an issue of historical and recent interest, whether it is access to actual collegiate style programs, or use of educational materials, such as books and magazines. The issue of mass incarceration makes this discussion even more timely, as the United States incarcerates more people than any other country, including counties such as China, that far exceed the US in terms of population. Currently, News Inside is in a pilot period, with the publication available in 30 facilities and 19 states. The Marshall Project is raising money to expand the reach of the publication to all 50 states. Bartley is acutely aware of the potential problems with making the publication available to sites across the country, as he notes that prison administrators could view it as “inflammatory” or likely to “stir unrest,” so he has chosen content with this potential obstacle in mind. This article has been altered from its initial form. The call for “first-person essays from those who work or live in the criminal justice system” is for a different Marshall Project endeavor called Life Inside. Kristen Munnelly has a B. A. in Biological Sciences and Anthropology from Cornell University, and a M. A. in Anthropology from the University of Michigan. Currently, she works in corporate and foundation relations at the Mount Sinai Health System, focusing on funding for early career scientists. Guantánamo is out of the news these days, but its toxic legacy remains with us.